People frequently use physical appearance stereotypes to categorize individuals when their group membership is not directly observable. Recent research indicates that political conservatives tend to use such stereotypes more than liberals do because they express a greater desire for certainty and order. In the present research, we found that conservatives were also more likely to negatively evaluate and distribute fewer economic resources to people who deviate from the stereotypes of their group. This occurred for people belonging to both preexisting and novel groups, regardless of whether the stereotypes were real or experimentally fabricated. Critically, conservatives only negatively evaluated counterstereotypical people when the stereotypes were functional—that is, when they expected that they would need to use the stereotypes at a later point to categorize individuals into groups. Moreover, increasing liberals’ desire for certainty led them to negatively evaluate counterstereotypical people just like conservatives did. Thus, conservatives are not only more likely to use stereotypes than are liberals, but are especially likely to negatively evaluate counterstereotypical people to organize the social world with greater certainty. Our vocal tone—the prosody—contributes a lot to the meaning of speech beyond the actual words. Indeed, the hesitant tone of a “yes” may be more telling than its affirmative lexical meaning. The human brain contains dorsal and ventral processing streams in the left hemisphere that underlie core linguistic abilities such as phonology, syntax, and semantics. Whether or not prosody — a reportedly right-hemispheric faculty — involves analogous processing streams is a matter of debate. Functional connectivity studies on prosody leave no doubt about the existence of such streams, but opinions diverge on whether information travels along dorsal or ventral pathways. Here we show, with a novel paradigm using audio morphing combined with multimodal neuroimaging and brain stimulation, that prosody perception takes dual routes along dorsal and ventral pathways in the right hemisphere. In experiment 1, categorization of speech stimuli that gradually varied in their prosodic pitch contour (between statement and question) involved (1) an auditory ventral pathway along the superior temporal lobe and (2) auditory-motor dorsal pathways connecting posterior temporal and inferior frontal/premotor areas. In experiment 2, inhibitory stimulation of right premotor cortex as a key node of the dorsal stream decreased participants’ performance in prosody categorization, arguing for a motor involvement in prosody perception. These data draw a dual-stream picture of prosodic processing that parallels the established left-hemispheric multi-stream architecture of language, but with relative rightward asymmetry. Brain mitochondria function links anxiety with social subordination. Dominance hierarchies are integral aspects of social groups, yet whether personality traits may predispose individuals to a particular rank remains unclear. Here we show that trait anxiety directly influences social dominance in male outbred rats and identify an important mediating role for mitochondrial function in the nucleus accumbens. High-anxious animals that are prone to become subordinate during a social encounter with a low-anxious rat exhibit reduced mitochondrial complex I and II proteins and respiratory capacity as well as decreased ATP and increased ROS production in the nucleus accumbens. A causal link for these findings is indicated by pharmacological approaches. In a dyadic contest between anxiety-matched animals, microinfusion of specific mitochondrial complex I or II inhibitors into the nucleus accumbens reduced social rank, mimicking the low probability to become dominant observed in high-anxious animals. Conversely, intraaccumbal infusion of nicotinamide, an amide form of vitamin B3 known to enhance brain energy metabolism, prevented the development of a subordinate status in high-anxious individuals. We conclude that mitochondrial function in the nucleus accumbens is crucial for social hierarchy establishment and is critically involved in the low social competitiveness associated with high anxiety. Our findings highlight a key role for brain energy metabolism in social behavior and point to mitochondrial function in the nucleus accumbens as a potential marker and avenue of treatment for anxiety-related social disorders. Socioeconomic status, inflammatory reactivity, and social support. Low socioeconomic status (SES) during childhood confers risk for adverse health in adulthood. Accumulating evidence suggests that this may be due, in part, to the association between lower childhood SES and higher levels of pro-inflammatory cytokines. Drawing from literature showing that low childhood SES predicts exaggerated physiological reactivity to stressors and that lower SES is associated with a more communal, socially attuned orientation, we hypothesized that inflammatory reactivity would be more greatly affected by cues of social support among individuals whose childhood SES was low than among those whose childhood SES was high. In two studies, we found that individuals with lower subjective childhood SES exhibited greater reductions in pro-inflammatory cytokine reactivity to a stressor in the presence of a supportive figure (relative to conditions with an unsupportive or neutral figure). These effects were independent of current SES. This work helps illuminate SES-based differences in inflammatory reactivity to stressors, particularly among individuals whose childhood SES was low. I belong to the Gay Men's Chorus of South Florida, which completed a series of five Christmas season concerts over the past two weeks. Singing in these performances, and doing a piano duet accompaniment for one of the pieces, I was exhausted for several days. Being in the chorus reminds me of church and boy scout groups of my youth. It is a communal setting where there is a sense of family, laughter, love and community. I am struck by parallels with Mark Oppenheimer's description of another secular equivalent to church communities, the CrossFit gym movement. Members speak about their "box," or gym..
...as others might speak about a church or synagogue community. The same is true of some 12-step program members, and devoted college-football fans. In an increasingly secular America, all sorts of activities and subcultures provide the meaning that in the past, at least as we imagine it, religious communities did. What really struck us was the way in which people were bringing their kids to their box...or the way different workouts of the day were named after soldiers who had died in battle. So there’s all of these things you would expect to see in a church — remembering the dead through some sort of ritual, and intergenerational community. In a similar vein, David Brooks writes about educational communities of character. He cites a number of examples of secondary school settings that emphasize kindness, respect, and responsibility in binding together a learning community. I want to pass on some clips from a review by Cameron et al. that summarizes, and has links to, a number of studies that deal our ability to share the experiences of others. While a single crying child or injured puppy tugs at our heartstrings, large numbers of suffering people, as in epidemics, earthquakes and genocides, do not inspire a comparable reaction...Not only does empathy seem to fail when it is needed most, but it also appears to play favorites. Recent studies have shown that our empathy is dampened or constrained when it comes to people of different races, nationalities or creeds. These results suggest that empathy is a limited resource, like a fossil fuel, which we cannot extend indefinitely or to everyone. While we concede that the exercise of empathy is, in practice, often far too limited in scope, we dispute the idea that this shortcoming is inherent, a permanent flaw in the emotion itself. Inspired by a competing body of recent research, we believe that empathy is a choice that we make whether to extend ourselves to others...one of us, Daryl Cameron, along with the psychologist Keith Payne, conducted an experiment to see if ...motivational factors could explain why we seem more empathetic to single victims than to large numbers of them. Participants in this study read about either one or eight child refugees from the Darfur region of Sudan. Half of the participants were led to expect that they would be asked to make a donation to the refugee or refugees, whereas the other half were not. When there was no financial cost involved in feeling empathy, people felt more empathy for the eight children than for the one child, reversing the usual bias. If insensitivity to mass suffering stemmed from an intrinsic limit to empathy, such financial factors shouldn’t have made a difference. Male and female brains do not constitute two distinct categories. In middle-aged women, poor health can cause unhappiness. After allowing for this association and adjusting for potential confounders, happiness and related measures of wellbeing do not appear to have any direct effect on mortality. Brain plasticity, defined as the capability of cerebral neurons to change in response to experience, is fundamental for behavioral adaptability, learning, memory, functional development, and neural repair. The visual cortex is a widely used model for studying neuroplasticity and the underlying mechanisms. Plasticity is maximal in early development, within the so-called critical period, while its levels abruptly decline in adulthood. Recent studies, however, have revealed a significant residual plastic potential of the adult visual cortex by showing that, in adult humans, short-term monocular deprivation alters ocular dominance by homeostatically boosting responses to the deprived eye. In animal models, a reopening of critical period plasticity in the adult primary visual cortex has been obtained by a variety of environmental manipulations, such as dark exposure, or environmental enrichment, together with its critical component of enhanced physical exercise. 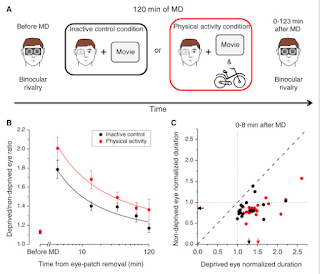 Among these non-invasive procedures, physical exercise emerges as particularly interesting for its potential of application to clinics, though there has been a lack of experimental evidence available that physical exercise actually promotes visual plasticity in humans. 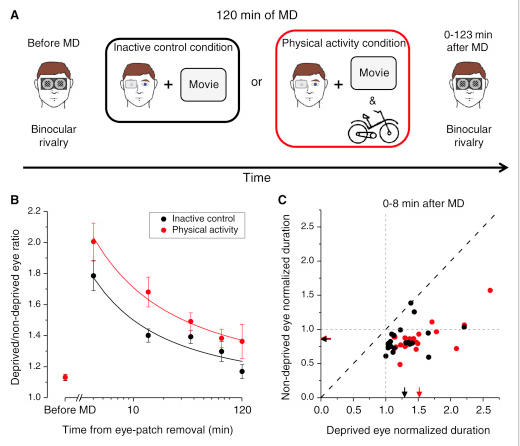 Here we report that short-term homeostatic plasticity of the adult human visual cortex induced by transient monocular deprivation is potently boosted by moderate levels of voluntary physical activity. These findings could have a bearing in orienting future research in the field of physical activity application to clinical research. Gretchen Reynolds points to a study in the Mayo Clinic Proceedings that reviews studies published in PubMed since 2000 that included at least 500 runners and 5-year follow-up to analyze the relationship between running, cardiovascular disease, and all-cause mortality. The optimal dose of running required for protection is surprisingly small. Running for 20-30 minutes twice per week appears to give maximum benefits. Three to four times the duration of walking is needed to achieve the same benefits. Coffee consumption correlates with lower risk of dying. Exercise enhances frontal brain lateralization characteristic of younger brains. • Association among fitness, brain activation, and cognitive function was examined. • Frontal laterality during Stroop task in older men was assessed by fNIRS. • We found the association between ventilatory threshold and Stroop performance. • The association was mediated by the lateralized prefrontal activation. Previous studies have shown that higher aerobic fitness is related to higher cognitive function and higher task-related prefrontal activation in older adults. However, a holistic picture of these factors has yet to be presented. As a typical age-related change of brain activation, less lateralized activity in the prefrontal cortex during cognitive tasks has been observed in various neuroimaging studies. Thus, this study aimed to reveal the relationship between aerobic fitness, cognitive function, and frontal lateralization. Sixty male older adults each performed a submaximal incremental exercise test to determine their oxygen intake at ventilatory threshold (VT) in order to index their aerobic fitness. They performed a color–word Stroop task while prefrontal activation was monitored using functional near infrared spectroscopy. As an index of cognitive function, Stroop interference time was analyzed. Partial correlation analyses revealed significant correlations among higher VT, shorter Stroop interference time and greater left-lateralized dorsolateral prefrontal cortex (DLPFC) activation when adjusting for education. Moreover, mediation analyses showed that left-lateralized DLPFC activation significantly mediated the association between VT and Stroop interference time. These results suggest that higher aerobic fitness is associated with cognitive function via lateralized frontal activation in older adults. Recent findings have demonstrated that mindfulness meditation significantly reduces pain. Given that the “gold standard” for evaluating the efficacy of behavioral interventions is based on appropriate placebo comparisons, it is imperative that we establish whether there is an effect supporting meditation-related pain relief above and beyond the effects of placebo. Here, we provide novel evidence demonstrating that mindfulness meditation produces greater pain relief and employs distinct neural mechanisms than placebo cream and sham mindfulness meditation. Specifically, mindfulness meditation-induced pain relief activated higher-order brain regions, including the orbitofrontal and cingulate cortices. In contrast, placebo analgesia was associated with decreased pain-related brain activation. These findings demonstrate that mindfulness meditation reduces pain through unique mechanisms and may foster greater acceptance of meditation as an adjunct pain therapy. Mindfulness meditation reduces pain in experimental and clinical settings. However, it remains unknown whether mindfulness meditation engages pain-relieving mechanisms other than those associated with the placebo effect (e.g., conditioning, psychosocial context, beliefs). To determine whether the analgesic mechanisms of mindfulness meditation are different from placebo, we randomly assigned 75 healthy, human volunteers to 4 d of the following: (1) mindfulness meditation, (2) placebo conditioning, (3) sham mindfulness meditation, or (4) book-listening control intervention. We assessed intervention efficacy using psychophysical evaluation of experimental pain and functional neuroimaging. Importantly, all cognitive manipulations (i.e., mindfulness meditation, placebo conditioning, sham mindfulness meditation) significantly attenuated pain intensity and unpleasantness ratings when compared to rest and the control condition (p less than 0.05). Mindfulness meditation reduced pain intensity (p = 0.032) and pain unpleasantness (p less than 0.001) ratings more than placebo analgesia. Mindfulness meditation also reduced pain intensity (p = 0.030) and pain unpleasantness (p = 0.043) ratings more than sham mindfulness meditation. Mindfulness-meditation-related pain relief was associated with greater activation in brain regions associated with the cognitive modulation of pain, including the orbitofrontal, subgenual anterior cingulate, and anterior insular cortex. In contrast, placebo analgesia was associated with activation of the dorsolateral prefrontal cortex and deactivation of sensory processing regions (secondary somatosensory cortex). Sham mindfulness meditation-induced analgesia was not correlated with significant neural activity, but rather by greater reductions in respiration rate. This study is the first to demonstrate that mindfulness-related pain relief is mechanistically distinct from placebo analgesia. The elucidation of this distinction confirms the existence of multiple, cognitively driven, supraspinal mechanisms for pain modulation. Note: In the sham mindfulness training, conditions were identical to mindfulness training session, but subjects were told just to close their eyes and take a deep breath 'as we sit here in meditation' every 2-3 min. They were not given the specific mindfulness-based instructions to pay attention to the breath, acknowledge arising thoughts, feelings, and/or emotion without judgment or emotional reaction, and simply return attention back to the breath. In the placebo training/conditioning sessions, participants were told they were participating in the trial of a new topical local anesthetic (actually petrolatum jelly) being tested for reducing pain after multiple applications. In all of the conditions, pain was induced by local heating of the skin. We propose that the propensity to think creatively tends to be associated with independence and self-direction—qualities generally ascribed to men—so that men are often perceived to be more creative than women. In a first study, we found that “outside the box” creativity is more strongly associated with stereotypically masculine characteristics (e.g., daring and self-reliance) than with stereotypically feminine characteristics (e.g., cooperativeness and supportiveness.) A second study found that a man is ascribed more creativity than a woman when they produce identical output. A third study analyzed archival data, and found that men’s ideas are evaluated as more ingenious than women’s ideas. Study four found that female executives are stereotyped as less innovative than their male counterparts when evaluated by their supervisors. Finally, we observed that stereotypically masculine behavior enhances a man’s perceived creativity, whereas identical behavior does not enhance a woman’s perceived creativity. This boost in men’s perceived creativity is mediated by attributions of agency, not competence, and predicts perceptions of reward deservingness. Gretchen Reynolds points to a study of 162 healthy female twin pairs, some identical, and some not, who 10 years previously had completed extensive examinations of their thinking and memory abilities, as well as measurements of their leg-muscle power. ...those who had had the sturdiest legs a decade ago showed the least fall-off in thinking skills, even when the scientists controlled for such factors as fatty diets, high blood pressure and shaky blood-sugar control...a muscularly powerful twin now performed about 18 percent better on memory and other cognitive tests than her weaker sister...in the brain imaging of the identical twins, if one genetically identical twin had had sturdier legs than the other at the start of the study, she now displayed significantly more brain volume and fewer “empty spaces in the brain” than her weaker sister. Keep in mind the 'this is only one study' caution. It involved only a single analysis of the brain health of middle-aged female twins. However, it is a plausible result, because it is known that exercise causes muscles to release brain growth factors, and sturdier muscles might be expected to release more. Blake et al. do an interesting experiment on how sensitive children are to inequality. They asked one child in a pair or to accept or reject an offer of Skittles on behalf of both of them. Between ages 4 and 15 offers that were equal for both children were accepted, but older children often refected offers that would provide more Skittles to their partner. The age at which children started rejecting such offers varied across the seven countries studied (Canada, India, Mexico, Peru, Senegal, Uganda, USA) suggesting different times for development of a sense of fairness. In three countries—the United States, Canada, and Uganda—some older children also rejected offers that were unfair to their partner. A sense of fairness plays a critical role in supporting human cooperation. Adult norms of fair resource sharing vary widely across societies, suggesting that culture shapes the acquisition of fairness behaviour during childhood. Here we examine how fairness behaviour develops in children from seven diverse societies, testing children from 4 to 15 years of age (n = 866 pairs) in a standardized resource decision task. We measured two key aspects of fairness decisions: disadvantageous inequity aversion (peer receives more than self) and advantageous inequity aversion (self receives more than a peer). We show that disadvantageous inequity aversion emerged across all populations by middle childhood. By contrast, advantageous inequity aversion was more variable, emerging in three populations and only later in development. We discuss these findings in relation to questions about the universality and cultural specificity of human fairness. I want to pass on the slightly edited abstract of a recent article on the evolutionary origins of music, "Music evolution and neuroscience," in Progress in Brain Research, written by my Univ. of Wisconsin colleague Charles Snowdon. There have been many attempts to discuss the evolutionary origins of music. We review theories of music origins and take the perspective that music is originally derived from emotional signals in both humans and animals. An evolutionary approach has two components: First, is music adaptive? How does it improve reproductive success? Second, what, if any, are the phylogenetic origins of music? Can we find evidence of music in other species? We show that music has adaptive value through emotional contagion, social cohesion, and improved well-being. We trace the roots of music through the emotional signals of other species suggesting that the emotional aspects of music have a long evolutionary history. We show how music and speech are closely interlinked with the musical aspects of speech conveying emotional information. We describe acoustic structures that communicate emotion in music and present evidence that these emotional features are widespread among humans and also function to induce emotions in animals. Similar acoustic structures are present in the emotional signals of nonhuman animals. We conclude with a discussion of music designed specifically to induce emotional states in animals, both cotton top tamarin monkeys and domestic cats. The effect of mindfulness meditation on false-memory susceptibility was examined in three experiments. Because mindfulness meditation encourages judgment-free thoughts and feelings, we predicted that participants in the mindfulness condition would be especially likely to form false memories. In two experiments, participants were randomly assigned to either a mindfulness induction, in which they were instructed to focus attention on their breathing, or a mind-wandering induction, in which they were instructed to think about whatever came to mind. The overall number of words from the Deese-Roediger-McDermott paradigm that were correctly recalled did not differ between conditions. However, participants in the mindfulness condition were significantly more likely to report critical nonstudied items than participants in the control condition. In a third experiment, which tested recognition and used a reality-monitoring paradigm, participants had reduced reality-monitoring accuracy after completing the mindfulness induction. These results demonstrate a potential unintended consequence of mindfulness meditation in which memories become less reliable. Religiousness decreases children’s altruistic behaviors. Prosocial behaviors are ubiquitous across societies. They emerge early in ontogeny and are shaped by interactions between genes and culture. Over the course of middle childhood, sharing approaches equality in distribution. Since 5.8 billion humans, representing 84% of the worldwide population, identify as religious, religion is arguably one prevalent facet of culture that influences the development and expression of prosociality. While it is generally accepted that religion contours people’s moral judgments and prosocial behavior, the relation between religiosity and morality is a contentious one. Here, we assessed altruism and third-party evaluation of scenarios depicting interpersonal harm in 1,170 children aged between 5 and 12 years in six countries (Canada, China, Jordan, Turkey, USA, and South Africa), the religiousness of their household, and parent-reported child empathy and sensitivity to justice. Across all countries, parents in religious households reported that their children expressed more empathy and sensitivity for justice in everyday life than non-religious parents. However, religiousness was inversely predictive of children’s altruism and positively correlated with their punitive tendencies. Together these results reveal the similarity across countries in how religion negatively influences children’s altruism, challenging the view that religiosity facilitates prosocial behavior.